Vice President Faisal Naseem on late Saturday declared that the most precious gift for Maldivians would be the sustained sovereignty of the nation. 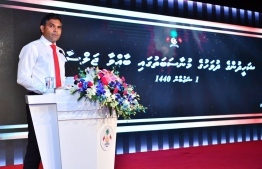 VP Naseem, who was the guest of honour at the ceremony held at Dharubaaruge convention centre to commemorate Martyr Day, asserted that enhancing relations between each other and standing together in solidarity are a necessity in such a globalised world where all kinds of "currents" exist. “The continuity of our precious gift, the true path of Islam that we received, are aspects that all beloved citizens of Maldives would want the most”, said VP Naseem during the event attended by some ministers of the current administration. Moreover, the Vice President highlighted the martyrdom of former sultans, Ali Rasgefaanu and Mohamed Thakurufaanu, along with Shaheed (Martyr) Corporal Hussain Adam’s on November 3, 1988, calling on the people to take examples from the heroes providing national service. He further noted that the majority of such incidents in history were insigated by locals who betrayed their country, and called upon the people to be aware. He stated that students must be taught the lessons learnt from history, which must be memorised and documented in writing. He further iterated that locals should take pride in the rich history of Maldives. Furthermore, the Vice President stated that the condition in which a nation is passed on and the people who passed it on are of utmost importance. He stated, “These are things we should consider and think about as we proceed in development”. Martyr’s Day is celebrated in Maldives to commemorate the memory of Ali Rasgefaanu, who was martyred in battle to protect the Islamic creed and sovereignty of the nation.